One of the giants of Cuban music, pianist and composer/arranger Bebo Valdés, died Friday in Switzerland due to complications from pneumonia, according to his wife and manager. He was 94. Ramón Emilio "Bebo" Valdés Amaro was born in 1918 in a village outside Havana. Trained at conservatory, and having absorbed the sounds of Afro-Cuban street music and American jazz in various ensembles, he became the house pianist and arranger at the Tropicana Nightclub in 1948. The Tropicana was the hottest venue in Havana at the time; many American entertainers performed there, and Valdés became known as the go-to arranger in town for studio dates, film scores and dance numbers. 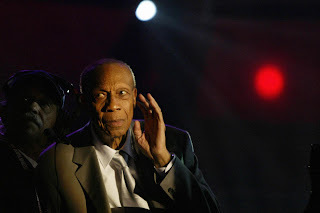 In 1952, he also participated in the first Afro-Cuban descarga, or jam session, recorded in Cuba, where a group improvisation turned into the recording "Con Poco Coco." But as his career was booming, a revolutionary government took over in Cuba, accompanied by a crackdown on the entertainment industry. 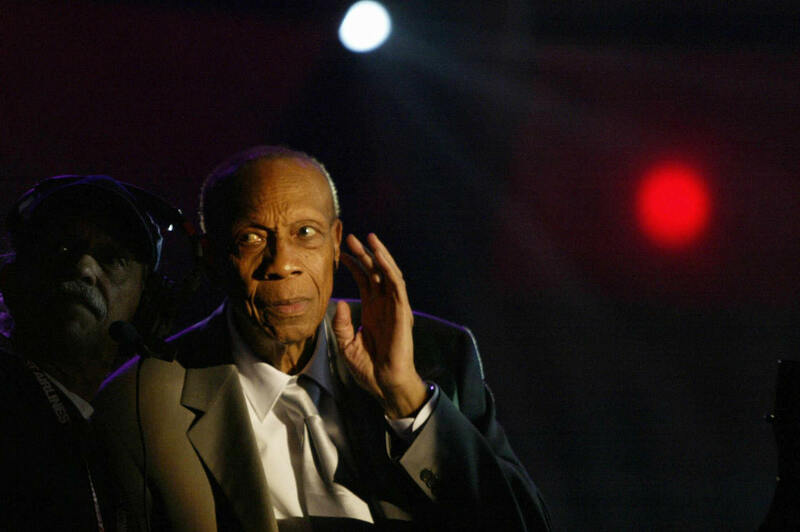 In 1960, he left Cuba to play a gig in Mexico City with his own band. He never returned, leaving behind his wife and children. Valdés eventually wound up in Sweden, where he remarried and pursued a quieter music career, often playing piano for cruise ships or in choice hotels. "If you are a musician and you do one thing, you should enjoy what you do," Valdés told NPR's Felix Contreras in 2006. "This is my profession, and it is my hobby, and I live in love with what I do. In those years in Stockholm, even if I wasn't successful, I did it because I liked it, and I'll keep doing it until I die." Meanwhile, one of his children had matured into a piano virtuoso himself, and had co-founded his own jazz-influenced, genre-crossing band called Irakere. When Chucho Valdes and Irakere played a date at Carnegie Hall in 1977, Bebo Valdes crossed the Atlantic Ocean to reunite with his son. It set into motion a reconciliation which resulted in several collaborations, in concert and on recordings like the Latin jazz performance film Calle 54 and the duet album Juntos Para Siempre. Late in his career, Bebo Valdés enjoyed a resurgence of popularity. In 1994, another Irakere veteran and Cuban exile, reedman Paquito D'Rivera, convinced Valdés to record Bebo Rides Again, a disc of Cuban classics mixed with original compositions. The album led to future recordings, among them Grammy-winning efforts like El Arte de Sabor and Lagrimas Negras. He was also the inspiration and pianist for the animated film Chico and Rita, about Cuban musicians in the 1940s. "This attention is a gift from God," he told NPR. "I did not ask for all of this. But since it was sent to me, I accept it from the heart."